Indian Coffee House at Hazrat Ganj in Lucknow used to be esteemed hangout place for Lucknow’s celebrities from the yesteryears. 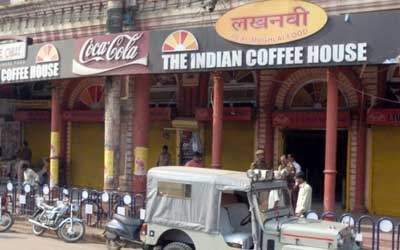 Any mention of Lucknow’s history would be incomplete without a reference to the Indian Coffee House. The place has been like a second home to poets, writers, critics, scholars, intellectuals, and stalwarts from politics and journalism. It has been a witness to the discussions among the who’s who about everything under the sun. It is true that we cannot go back in time to witness the glory that the place once radiated but that’s the great thing about history – it can always be revisited. ‘Lucknow Ka Coffee House’, a book authored by Mr. Pradeep Kapoor – an eminent journalist, gives an interesting insight into what the place actually stood for and what it still means to scholars, witnesses, and guardians of Lucknow’s glorious past. The Indian Coffee house also holds a special place for Mr. Kapoor as his father Mr. Bishan Kapoor, a prominent journalist, was a regular at the Coffee House, which is enough a reason for Mr. Pradeep Kapoor to feel emotionally connected with the place right from his childhood. The book – Lucknow Ka Coffee House, is a part of a 41-book series titled ‘Hamara Lucknow Pustak Mala’ – a series that covers everything – right from the pre-nawabi era to Lucknow’s contribution to Bollywood and even those aspects of the city which largely remain unknown among many. In this book, Mr. Kapoor shares many tid-bits as well as his own experiences about everything that went on in the coffee house when it used to be a social, political and literary hub. Even today, when people want to do something different to add to their memories, they visit Indian Coffee House for a heartful chat and lip-smacking espresso coffee. The interiors and the furniture is renovated and doesn’t give a vintage look but the place may still have its energy intact. You don’t get bugged for ordering more food or coffee. Time still stops there. People still get lost in long discussions and never-ending debates, seemingly aware of the chaotic traffic and cacophony right outside. Do try this out… you would agree too. Pretty interesting 🙂 It was great having coffee and chit chat with a friend right here. No doubt Coffee and Meaningful discussions go together… We have lost a lot of who and what we really are. Wonder if someone would catch a bit of story on Allahabad Coffee house too. Wonder what has really changed in these coffee houses ….was it earlier they were run as a cooperative or something…? Why is that we can’t preserve these amazing places in the vintage way…? That would be such a great way to not lose touch with our past. Look forward to the book and thanks to Mr. Pradeep and Shaharnama for bringing this up.